Photo courtesy of Bing Crosby Enterprises. To most Americans, he was the eternal Crooner: a much celebrated and beloved performer of unparalleled popularity. 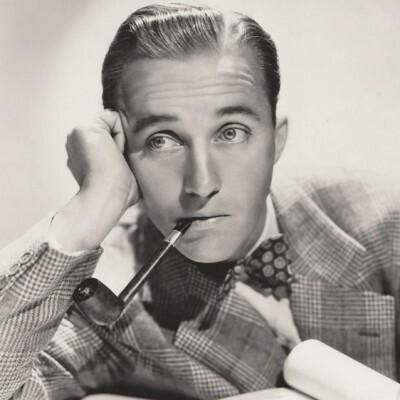 Yet Bing Crosby was far more than that: He was an architect of 20th century entertainment, a force in the development of three industries that barely existed when he came into the world: recordings, motion pictures, and broadcasting. As the most successful recording artist of all time; an abiding star of movies, radio, and television; and a firm believer in the wonders of technology, he helped to transform and define the cultural life not only of the United States, but of the world. When Harry Lillis Crosby was born, on May 3, 1903, to a working-class, Catholic Irish-Anglo family with deep roots in the American Northwest, there was little reason to think he would amount to much. Though an obviously intelligent and conscientious student, his primary interests were sports (he won many swimming medals), school plays, and music–he played drums (not very well), sang, and whistled. At Gonzaga University, he decided to study law because he could think of nothing better at the time and it pleased his parents. He left law school two months before graduating. Music lured him away. It had always been part of the Crosby household. His father, who played mandolin, led the family in song and bought one of the first phonographs in Spokane, Washington. Harry was the fourth of seven siblings. Nicknamed Bing for his love of a newspaper parody, “The Bingville Bugle,” he listened to everything; he attended the vaudeville shows that came through town, regaling his friends afterward with detailed accountings of each act. He landed a backstage job when the legendary Al Jolson performed in Spokane, and studied his every gesture from the wings. A younger boy named Al Rinker sealed Bing’s fate, asking him to play drums in his five-piece dance band. When the other fellows in the group, the Musicaladers, heard him sing, they didn’t much care how he played the drums. Even at that age, Bing had a mellifluous, solid baritone with good range, a steady sense of time, and a casual charm. With his uncanny memory, Bing could learn songs after hearing them once, though he never learned to read music. After the band broke up, Bing worked locally with Rinker, who accompanied him on piano. In 1925, Al suggested that they pool their funds and drive a broken-down flivver to Los Angeles, where his sister–the not-yet-celebrated jazz singer Mildred Bailey–might get them a job. She got them an audition, which was all they needed. Bing and Al toured in one vaudeville show after another, up and down the West Coast, until a couple of musicians from Paul Whiteman’s band chanced to hear them. Within a year after leaving Spokane, Crosby and Rinker were under contract to the most famous orchestra in the country. They were on their way to New York. Despite a few setbacks and a too-eager embrace of big city temptations, Bing refined his style. He was inspired by his idol and lifelong friend, Louis Armstrong. Whiteman teamed Bing and Al with a pianist and songwriter, Harry Barris, calling them the Rhythm Boys: They became the first successful jazz vocal group. Yet it was Crosby’s way with a song that most impressed Whiteman’s arrangers and musicians, who lobbied for more Bing solos. The word was out: Bing brought something new to American song: rhythmic excitement, virile authority, emotional candor. The best jazz musicians of the day accepted him as one of their own. He recorded with Bix Beiderbecke and Duke Ellington. Soon, every major American songwriter, among them Irving Berlin, Cole Porter, Hoagy Carmichael, Johnny Mercer, Jimmy Van Heusen, and Johnny Burke, were writing songs for him. Within a few years, the Rhythm Boys left Whiteman. Then Bing left the Rhythm Boys. 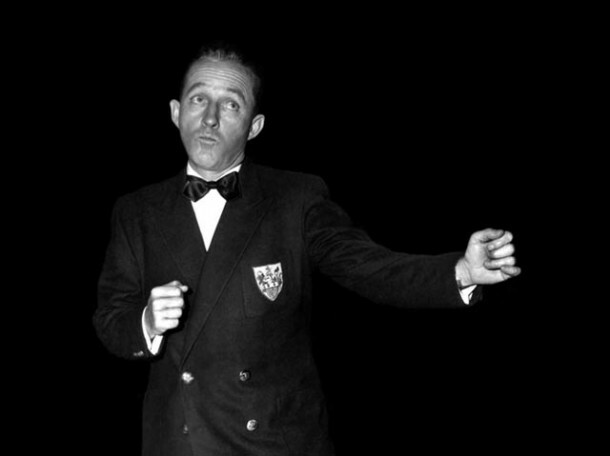 Working in nightclubs and headlining in theaters, Bing was the first vocalist to use the microphone as an instrument, enabling him to communicate subtle emotions and musical nuance. When he appeared at the Coconut Grove, the movie community flocked to hear him. Producer Mack Sennett hired him to make a series of comedy shorts. 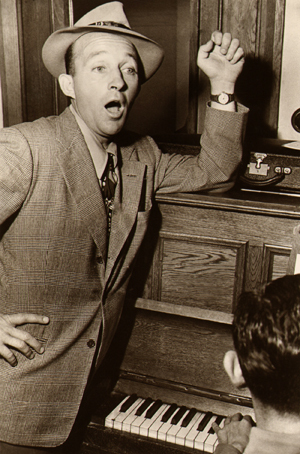 William Paley, of the fledgling CBS network, gave him a daily radio show. Paramount Pictures brought him to Hollywood to star in The Big Broadcast; the studio quickly signed him to a three-picture deal that grew into a 20-year association. Meanwhile, record executive Jack Kapp, using Bing’s loyalty to him as a come-on, found backing to start his own company, Decca, which saved the then moribund industry by lowering the price of records. Kapp convinced Bing that he was more than a jazz or ballad singer, encouraging him to sing every kind of song and positioning him as the voice of America–home grown, unaffected, unassuming, and irresistible. Bing’s popularity really took off a year later, when NBC asked him to take over its faltering program, The Kraft Music Hall. Bing turned it into the archetypal broadcast variety show, a template still in use today. The public and critics loved him. At a time when radio was dominated by schooled, oratorical voices, Bing sounded like the guy next door. People trusted him: Instead of pandering to the presumed tastes of the masses, Bing combined pop, jazz, opera, and classical music. He was as much admired for his unique brand of slang, offbeat sense of humor, and unruffled disposition as for his singing. In the dark days of the Depression, Bing was a beacon of optimism. He became still more of a national force during World War II, touring at home and abroad, making a record number of V-Discs, selling a record number of war bonds, personally answering thousands of letters from servicemen and their families. Bing’s radio show regularly attracted an audience of 50 million–an unheard of number. He starred in the Road movies, with Bob Hope, one of the most durable, profitable, and imitated comedy series in film history. In 1944, Bing won an Academy Award for his performance as Father O’Malley in Leo McCarey’s Going My Way. At the end of the war, an Army poll declared him the individual who had done the most to boost wartime morale. 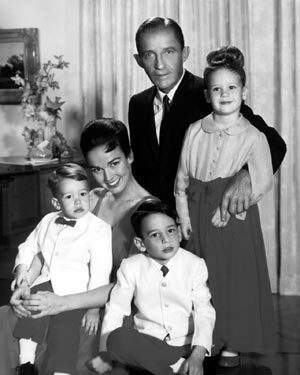 The postwar years represented the peak of Bing’s success. Between 1946 and 1948, he revolutionized the entertainment industry. Having recorded shows on transcription discs for soldiers, he now insisted on prerecording his radio show. In those days, all radio programs were broadcast live and NBC took him to court. Bing won and moved to ABC, an also-ran network that, thanks to Bing, became a major competitor to NBC and CBS. After he produced the first prerecorded radio series, other entertainers quickly followed suit. Billboard called Bing’s gamble the most important show business story since the invention of talking pictures. But Bing realized that transcribed sound (recorded on large lacquered discs) was not as good as a live broadcast. When he heard about former Army engineer, John Mullin, who was experimenting with tape-based recording, Bing offered to sponsor him. Using the early tape machines, he converted his studio to tape, allowing him to record and edit his program. As he and his engineer experimented with the new medium, they introduced such broadcasting devices as canned laughter and applause. The entire business followed his lead in turning to tape, which remained the industry standard until the advent of digitalization nearly 35 years later. Bing continued to make hit records and movies into the 1960s, at which time he began to slow down, reserving most of his work for television, including a series of variety specials, frequent appearances as host of The Hollywood Palace, television movies, and an annual Christmas show that became a national tradition. He spent more time on the golf course and at the race track – devoting himself to the two sports he helped pioneer by creating the first celebrity pro-am golf tournament and taking the lead in building the Del Mar race track. Bing Crosby with his second wife Kathryn and their children Mary, Harry and Nathaniel. Bing’s first wife, Dixie Lee, the mother of his first four sons, died in 1952. During the next few years, he was regularly gossiped about in newspaper columns as he romanced several of Hollywood’s most beautiful women. In 1957, he married Kathryn Grant, a young actress and singer he had met on the Paramount lot. Together they had two sons and a daughter. The Crosby family became the focus of his Christmas program, and of his historic return to the stage, in 1976, performing in Los Angeles, New York, London, Oslo, and elsewhere. When he died on a golf course in Madrid, on October 14, 1977, he was mourned the world over. On that day, Major League Baseball honored him by pausing for a moment of silence at the start of the World Series game between the Los Angeles Dodgers and New York Yankees. No other entertainer has ever won the hearts of so many and held them for so long.